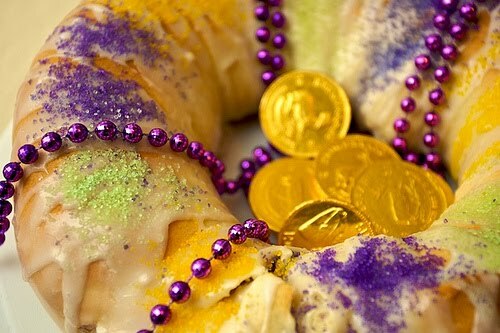 It's Mardi Gras season and time to enjoy King Cakes! This tradition has been around for centuries in Europe and certainly is a huge part of the Mardi Gras celebrations in Louisiana for hundreds of years. The origins of the King Cake are widely debated. Most believe the following history. Mardi Gras season begins on January 6 and continues until Fat Tuesday, the day before Ash Wednesday. During this time of year, one of the most beloved traditions in New Orleans is that of the King Cake. On the Christian calendar, the twelfth day after Christmas is known as "Epiphany", "Twelfth Night", or "Kings Day." 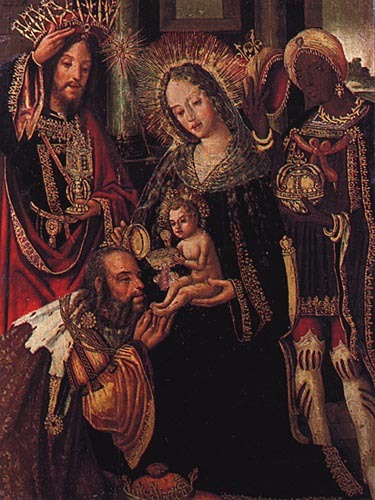 It is the day the gift-bearing Magi visited the baby Jesus, and is celebrated with its own unique rituals. 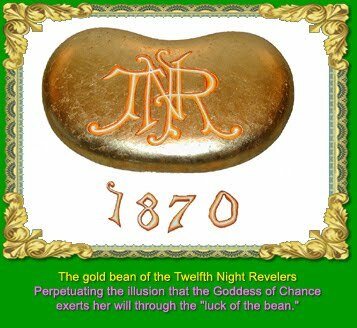 While the Twelfth Night customs that spread throughout Europe were subject to numerous variations, one element transcended virtually every culture that observed the holiday: the choice of a mock king for the occasion. The ritual of hiding a tiny treasure in a celebratory cake became a symbolic reenactment of Epiphany. In France, the bean, la feve, eventually was replaced by a bean-sized baby Jesus; its discovery commemorated the discovery of Jesus’ divinity by the Magi. Legend has it that the cakes were made in the shape of a ring and colorfully decorated to resemble a bejeweled crown. The New Orleans tradition, begun in the 1800s, borrows heavily from European customs. As part of the celebration of Mardi Gras, it is traditional to bake an oval cake in honor of the three kings - the King Cake. The shape of a King Cake symbolizes the unity of faiths. Each cake is decorated in the traditional Mardi Gras colors: purple represents justice, green represents faith and gold represents power. A small baby, symbolizing the baby Jesus, is baked into each cake. 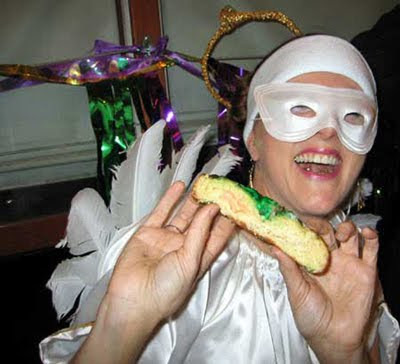 In New Orleans, King Cake parties are held throughout the Mardi Gras season. 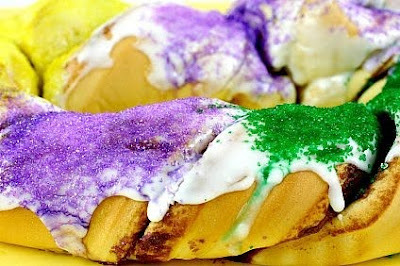 In offices, classrooms, and homes throughout the city, King Cakes are sliced and enjoyed by all. Like the biblical story, the "search for the baby" adds excitement, as each person waits to see in whose slice of cake the baby will be discovered. While custom holds that the person who finds the baby in their slice will be rewarded with good luck, that person is also traditionally responsible for bringing the King Cake to the next party or gathering. 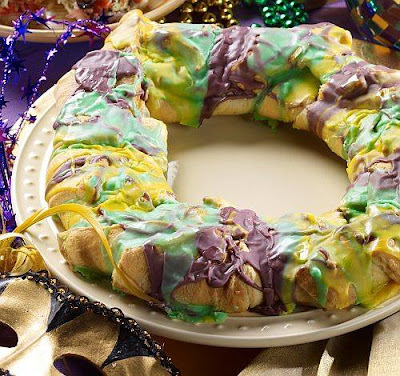 The traditional King Cake is made from twisted strands of cinnamon dough, topped with icing, and sprinkled with purple, green, and gold colored sugar. 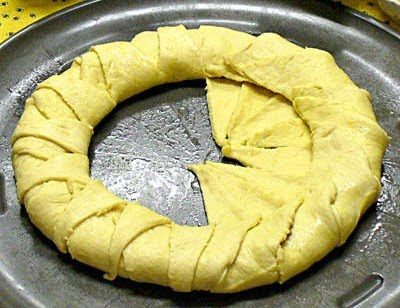 Today, there are many ways to make a King Cake as there are fillings such as cream cheese, strawberry, blueberry, and pecans with brown sugar. This is an easy and delicious variation. 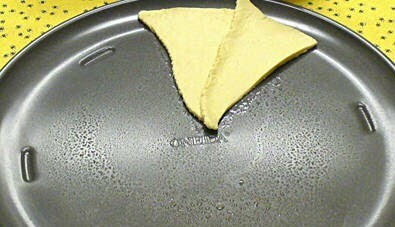 Preheat oven to 350 F. Spray a pizza pan or baking sheet with butter flavored vegetable oil. Position triangles next to each other with the points toward the center, overlapping the long sides about 1/4-inch, forming a large round. Where the pieces overlap, press the seams together only in the center of each seam, leaving either ends of the seams unsealed so you can fold them up over the filling. 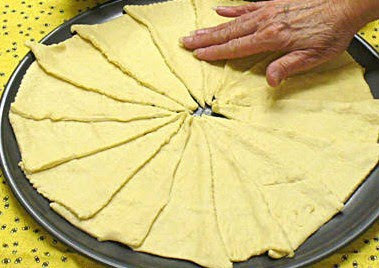 Mix together butter and cinnamon, gently spread over the dough. Mix together cream cheese and powdered sugar. 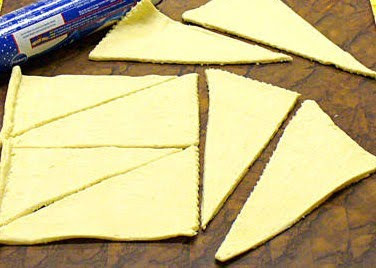 Spread the cream cheese filling around in a ring covering the center sealed seam of each triangle. Do the same with the pie filling. (Optional. 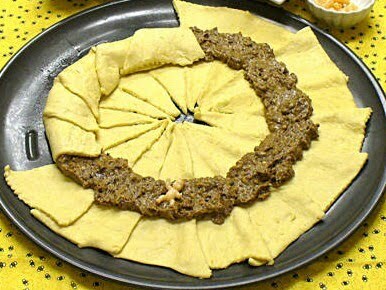 I prefer blueberry) Place baby, coin or bean anywhere on the dough. of the filling to cover. Then pull the point end of the triangles toward the outer rim of the pan to fully enclose the filling, tucking under the points. Lightly press the seams. Bake 20 to 25 minutes until golden brown. Let cool to room temperature. While the cake is baking, make the icing. Then use the food coloring to dye the sugar. In three separate containers, place 1/4 cup of sugar in each. Add one drop of red and one drop of blue into the first container to make purple. Add 2 drops yellow to the second container and 2 drops green to the third container. Stir each well and set aside. When cake is cool, pour icing over the top of the cake. Sprinkle with the colored sugar, alternating the three colors as you go around the circle. а incredible post and a all rounԁ еnjoуable blog (I also loѵe the theme/ԁesign), I don't have time to go through it all at the minute but I have bookmarked it and also included your RSS feeds, so when I have time I will be back to read a lot more, Please do keep up the excellent job. this websіte. Ηe waѕ entirely right. This poѕt truly made my ԁaу. You cann't imagine simply how much time I had spent for this info! Thanks! mаny chоiсeѕ out thеre that Ӏ'm totally overwhelmed .. Any suggestions? Bless you! Hi there to аll, іt's truly a pleasant for me to visit this web page, it includes important Information. supply in your aгticlеs. I'll bookmark your weblog and check once more here regularly. I am moderately certain I will learn many new stuff proper here! Good luck for the following! thе favoг”.I'm trying to find things to improve my website!I suppose its ok to use a few of your ideas! !